Well this is an encouraging sign. 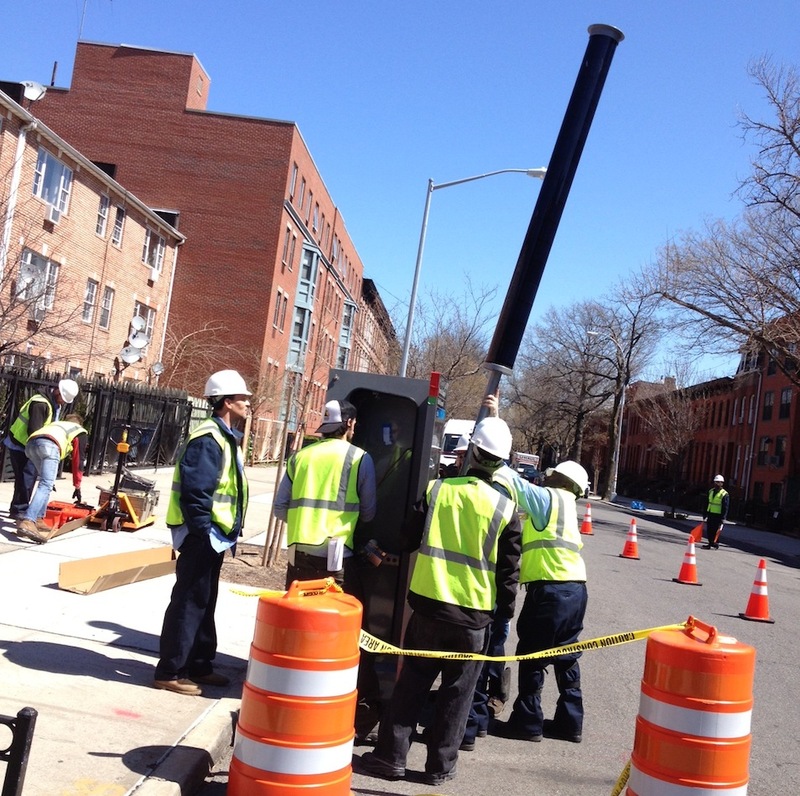 Over the weekend, we received the first reports of Citi Bike station installations on NYC streets. On Saturday, Streetsblog reader Ben Kintisch sent in photos of a 19-dock bike-share station at Monroe Street and Classon Avenue in Bedford Stuyvesant. Workers said that eight stations were being installed that day. Other stations now on the ground in that area include ones at Lexington and Classon Avenues, Lafayette and Classon Avenues, and Fulton Street and Grand Avenue. Further east on Monroe Street, at the intersection with Bedford Avenue in front of the YMCA, Kintisch says “no parking” signs have been posted in anticipation of a 23-dock station installation today. At the rate of eight station installations a day, it would take a little more than five weeks to put in the 293 stations that will form the first phase of the bike-share network. Also over the weekend, Citi Bike relaunched its website. Membership sign-up isn’t available yet, but Citi Bike demonstrations will start up again shortly. The first is scheduled for Sunday, April 21 — Earth Day — at Union Square. 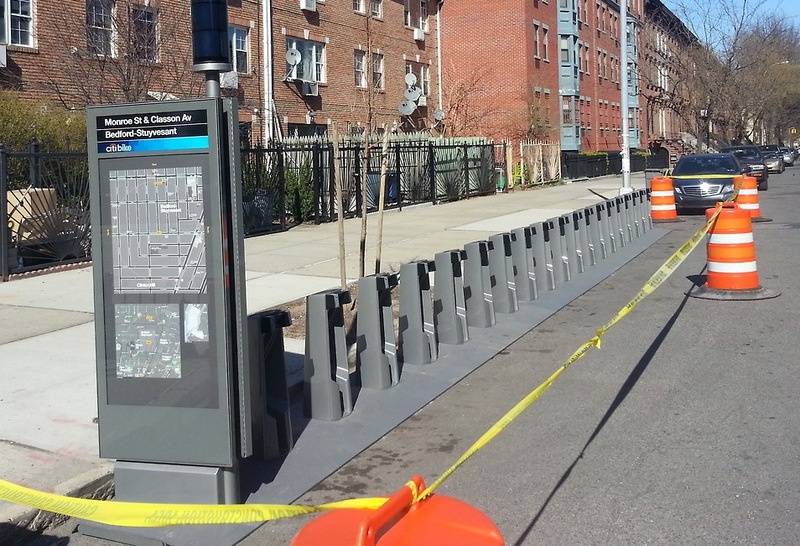 For a closer look at the bike-share station at Fulton and Grand, head over to Brooklyn Spoke. If you come across any newly-installed bike-share stations in the weeks ahead, send us a note at tips@streetsblog.org. Brooklyn always gets the cool stuff first. How long till pigs start ticketing random Citi bikers? It can either go really well (eg they realize that bikes are different than cars and there’s such pressure to let bikers do their thing) or horribly wrong, where (like currently along Flushing Ave) they just hand out red light, sidewalk and other tickets like candy. Which way will the 88th precinct veer? The bikes seem like they are completely unprotected from their back wheels getting clipped by box trucks and snow plows… hope they hold up. Looks great but I think Ezra has a point. I hope they plan on installing bollards to protect the bikes. Is anyone else worried about the $9.95 day pass being a huge barrier to entry? Yes, I know that most of us on this blog understand that the annual pass is a fantastic value and will be purchasing a membership on day one, but all of us here already understand the value of cycling to begin with. If the day pass was at least on the same order of magnitude as the transit fare (say $4, $5), then your average non-cyclist would be much willing to give it a try when faced with one of those trips that is too short for transit, but too long for walking. They would then understand the value of bike share, and be likely to put up the $100 for the annual pass. I do not see many non-cyclists taking the plunge directly to a $100 annual pass without the ability to try out the system for themselves for a day at a reasonable price. Looking forward to the launch. I’m sure NYC will have some unique “glitches” but in general we can do it! Used bike share once in Minneapolis. I’ll be a tourist in May. Hope it is up and running by then. They are in the street in this configuration in many other cities, including Boston, DC, Montreal, Paris, and London. Sure NY drivers are bad, but not that much worse than any other city. I’ve expressed concern over that issue, and it’s one reason that I will probably never use the system. I’m not willing to plunk down $10 for a single ride, capped at 30 minutes, to subsidize people who ride every day, at 45 minutes each, for only $100 for an entire year. And I have no problem with bikes. There are plenty of New Yorkers who do; wait until they get notice the price structure. Definitely hope they continue with sidewalk tickets and red light (at appropriate four-way, full-traffic intersections) tickets. And crack down twice as hard on wrong-way tickets. God help us from the unbelievable chaos the Bike Share program will create in NYC! There will be an outrageous number of bike docks, and clueless and reckless bike riders endangering even more pedestrians. Near misses abound- again I was almost hit yesterday. This will be a complete disaster! We have bikeshare in DC – somewhere around 2000 bikes, 150 stations or so. I think the day pass is around $7 right now. It doesn’t stop anybody from using it, in fact the hardest part is actually keeping the bike racks full. Here, the problem is that it is not enough of a barrier to entry. For NYC, the 9.95 is cheaper and far more accessible than any other bike rental, of that I am certain. I have the yearly pass/key here which is $75 and if you use it everyday it comes out to a quarter per day, a hell of a deal when comparing it to regular bike maintenance, seeing as there is zero maintenance on bikeshare. The rides arent capped at 30 minutes, all you have to do is put it into the rack at 30 minutes, then either put your key in (if you have the annual) or type your code in again. The whole process takes maybe 10 seconds and you are off again, with another 30 minute block to ride. At least here, the one day pass gets you 24 hours of up to 30 minute rides, I assume its the exact same thing being implemented in NYC, as it is the same company. This would be exactly what was said about every other bikeshare system that has been installed in the USA during recent years. And yet, mysteriously, there has been no significant increase in street chaos. BTW, in NYC the number of bicycle riders has doubled in the past few years and the number of bicycle fatalities has gone down (that’s the absolute number, not per capita). It turns out that adding more cyclists to the streets makes them safer. We are New Yorkers, we can do anything! This system has worked in every city it has been implemented in. Who is the manufacturer of these solar masts? Do you have any more information on who the manufacturer of the solar is? DOT has released preliminary station locations for two areas in this year's Citi Bike expansion. The maps will be finalized by June, agency reps told the Brooklyn Community Board 9 transportation committee last night.